It's not easy losing green. 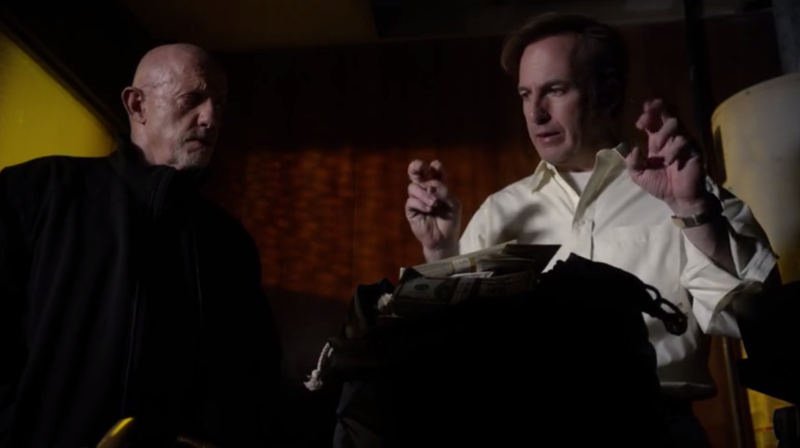 In the world of Breaking Bad and its prequel series Better Call Saul, bad things happen to bad people. They get blown up and poisoned and crushed by cars and choked and shot by machine guns. But the thing about the Breaking Bad universe is that bad things happen to bad people even when they do good things. Jimmy McGill knows this well. Jimmy, the future Saul Goodman, is not a good man. Not really. He has a long history as “Slippin’ Jimmy,” a small time con artist. He fakes his own heroism to draw clients. He ropes a kid into jumping in front of a car to try to cheat a woman out of her husband’s embezzled money. And takes money from the same woman to stay quiet. But where Breaking Bad was a story of Walter White’s constant, nearly superhuman ability to self-justify his own increasingly evil actions, Jimmy recognizes his moral failings. He tries to fight against them in the manner of Rocky’s first bout with Apollo Creed – bloody, battered, but still rising to his feet. Having seen Breaking Bad, we know he doesn’t get a knockout victory over his worst self. We’re just rooting for him to go the distance. So it’s a moment worth cheering when Jimmy figures out a way to steal the embezzled cash from the white-collar thieves, and return it to the county. It’s worth cheering even louder when he makes the agonizing decision to return what’s left of the cash given to him as a bribe. Former cop Mike Ehrmantraut, another morally compromised character, lifts his eyebrows at Jimmy’s decision, asks him what he’s doing. “The right thing,” Jimmy replies, fingers curled into air quotes, voice dripping with weariness. He knows he doesn’t get any real credit for “the right thing.” He knows “the right thing” means suffering. At the end of the episode, he kicks the door of his fancy new offices, the space he can’t keep because he gave back his ill-gotten gains, in tears and anger. Where Walter White felt entitled to success because of his brilliance, Jimmy’s entitlement stems from his tenacity and work ethic. He works hard enough to pass the bar after three tries, and gets his celebration immediately doused by the law firm that hired his brother. He rolls around in the garbage, writes legal letters on cardboard and toilet paper, tries to piece together shredded invoices to bring justice to the nursing home cheating his elderly clients. Yet, there’s a sense all this will collapse around him, showing Jimmy the straight and narrow is long, hard and full of dead ends. It can feel unfair, and you can already see Jimmy aching to rebel against unfair rules, to just start cheating. So it is in the Breaking Bad universe: Walter White’s sporadic attempts to do the right thing, to save his family, or protect an innocent, or help his partner Jesse, usually just ended up with him in a worse spot, forcing him to consider far worse things. “No more half measures,” Ehrmantraut famously advised Walter. In other words, you don’t get partial credit for being a good guy, just sometimes. If there’s any God in this universe, it’s the Old Testament kind, not the sort that wipes your slate clean with a moment of repentance. You can sell your soul, and it will destroy you and everything you love. But the devil keeps his end of the bargain. Walter White, ultimately, gets what he wants, at the cost of everything else. Contrast with how Walter’s brother-in-law Hank, an imperfect but ultimately righteous character, is executed by neo-Nazis. But he dies nobly, refusing to beg for his life, refusing to compromise. And his death sparked a chain of events that ultimately brought justice, of a sort, to all the scumbags in the series. That’s how karma works in this world: Doing the right thing is the right thing, but it doesn’t protect you from bullets or plane crashes or paralysis or bankruptcy. And doing the right thing certainly doesn’t mean you get what you want. Virtue, instead, is its own reward. For guys like Jimmy, however, virtue doesn't always pay the rent. Think you know Spokane-area movies? Take this quiz! Who's Really "The One who Knocks" on Breaking Bad? Three reasons for why it’s the best television drama ever.